Signs of stress in a home. Just a reminder we will not hold Classes on Saturday July 6th as I understand many of you are re-connecting with family and friends. Enjoy the holiday activities and please take time to have a plan in place to be sure your dog is safe from the overly stimulating and noisy events. While your dog may not have any sound sensitivity YET, if they become overwhelmed during loud firework displays, they will have a greater chance of developing sound and thunder storm fears. Keep in mind you may not see the changes in your dog until the next trigger. 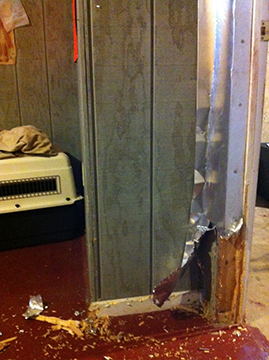 Trust me, just one loud boom could change your dog forever and not in a good way. So, again, have a plan to keep you dog in a safe place free from scary sounds and free from small strange children running into their space. Setting your dog up for success starts with a plan, soft music, his favorite mat or crate, a super yummy Kong and a favorite chew toy. Happy July 4th and keep everyone safe, pups included! I hope this article finds you enjoying the beginning of this new year! January brings so many beginnings, not just a new year, but New Year’s resolutions as well. Some personal, some professional and then some just for fun! Lately, I have been thinking about the fun resolutions — what it is I would enjoy, not what I feel I need to do. 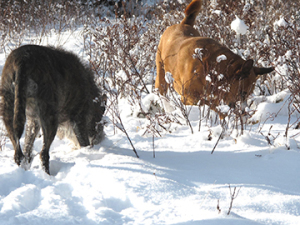 My idea of fun is walking through the snow in the woods, enjoying the fresh air and watching the dogs be dogs. Sniffing, chasing, marking, digging, what ever natural behaviors they choose as no leashes are ever used here! 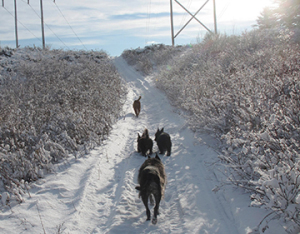 On our early morning walk today along the snowmobile trail with my 4 dogs, I realized my old girl Annie, who just crossed her thirteenth birthday had decided to wander off the trail into 8 inches of soft snow and was having difficulty backing up. 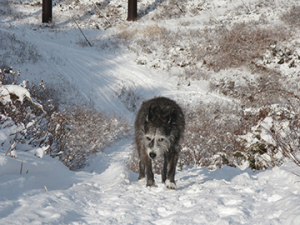 As I headed her way she gave a big wag of her tail and managed to get herself back on the trail. She must have either been thrilled to be free or simply didn’t want the others to get too far ahead because she lunged and actually ran several strides along the trail. With an open mouth soft body wags, she was one happy girl to be included on this adventure. While it is true an older dog can not always join in the fun, I can tell when Annie is at the door waiting and bouncing with the others she is ready to go. Other times, she does not get out of her cozy bed which tells me she is taking a pass. 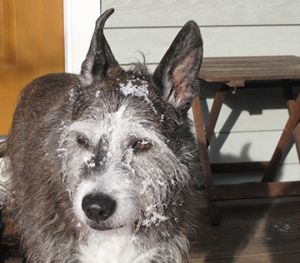 If you have an older dog, I hope you have time in your busy life to add some life enrichment activities for him or her! I believe you will find it both relaxing and rewarding. Have you ever been told “YOUR DOG JUST BIT ME”? In all honesty, I believe the owner of the dog that bites feels much worse than the person who has been bitten and is yelling. I am not talking about a bite that requires stitches, but a level one bruise with the front teeth. I understand the yelling is to make the owner feel bad, but trust me, the owner is already upset and wondering if they are going to be able to keep their beloved furry friend with those sweet eyes. When we choose to own a dog that we fear may bite someone, we need to first manage our dog so he cannot get himself into trouble. But, many dogs get worse when only management is used. For example, every time a guest arrives, Fido gets abandoned to the back bedroom, can you imagine being put in a room with a Grizzly Bear right on the other side of the door? How would you feel? Sure, when you open the door Fido will run through the house to see if the scary strangers are anywhere lurking, just to make sure he is safe and will not be ambushed and eaten! How sad is it that this Fido lives in real fear of the unknown stranger? 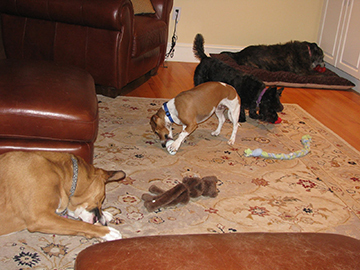 While many dogs can be socialized later in life with people and kids, there are some who just do not seem to improve. Maybe your training is going too fast for the dog to cope, maybe you are changing the stimuli too often, maybe you are changing the environment too often, maybe your dog does not know how to relax, maybe he does not see you as his protector, maybe he has protected himself before using a snap and it worked. Maybe he is becoming more sensitized then desensitized. Have you considered this scenario? A mother dog is about to give birth, she is stressed and confined but hears scary noises nearby so she barks to warn off any intruders. Studies suggest her pups may feel her stress even before she gives birth. Imagine the pups that are born in an empty lot, under a car, and all they hear for hours upon hours is their mother barking in frantic attempts to keep the humans away from coming near her or her litter. These pups are more likely to grow up believing humans are something to be feared because their mother said so and she knows best. Owning a dog who greets every new person in a defensive manner with a low growl, rapid barking, or lunging and snapping is certainly not for everyone. But what if you have fallen for those sweet eyes already? Using management that feels good to the dog, counter conditioning in a positive way, teaching our dogs to relax on cue, learning to understand your dogs body language when he needs space and talking to your vet about medication are all tools we use to help our dogs cope and stay safe. Remember: a dog that feels safe and less threatened, is also less defensive and less likely to bite! Now ask yourself, would YOU go sky diving, bungee jumping, climb Mt. Everest, become a vegetarian, give a speech on the fiscal cliff? Why not? Personally, I have my own fears like swimming in the ocean, I am terrified of drowning. Yet, we push our dogs to do things that terrify them because we have some fantasy that our dogs must be perfect. We are not and neither are they, so helping them feel safe and cope with their fears is better than thinking we need to change who they are. My little black foster scottie is making great progress in my home. While he was a door dasher when he arrived, he has learned to wait and ask permission to go outside. He has also learned to sit for affection, food or a treat. I find it hard to believe when I work with an older dog that does not know how to sit when asked. At six, this boy seems to love other dogs and is happy to be at someone’s side. He is learning the rules of tug, to lie down, and walk on a leash. He is already good at riding in the car and just waits patiently in my seat while I run errands. His biggest improvement is that he has warmed up to my husband and son which is really rewarding to see, as he seemed very worried about men when he arrived. Because I have seem many men pet this little fearful dog with no more growling, I believe he was worried about “the” man he lived with, not all men. This has become apparent over time and I am so thankful I took the time to ask him to show me what he was capable of. He has made such progress in the last 2 weeks, I am confident I will find him the right home. While many of us this week have been hugging and holding our children and grand children tighter as a result of the horrible shootings in Newtown CT., many of us have also sought to hold and love our pets. Our desire to keep all those we love feeling safer has increased dramatically in light of the recent tragedy among the young and innocent. Yet, when I reach to comfort my new 6 year old foster dog he growls and moves away from me. My desire to befriend and offer safety to this frightened dog is way more than he can handle at this point. The more I try, the more he withdraws. A new approach is clearly needed to earn the trust of with this little guy, so based on the many insights shared by Karen Pryer, I will play a series of “show me” games. This is a game many new horse owners play when they buy or ride a new horse, if I do this what will you do? Applying pressure with your hand or leg on different parts of a horse should be met with a behavior from the animal, hence, the relationship begins. Knowing that petting this dog’s back, would earn a “growl” verbal response as well as a stiffening of his body, I tried the back of my hand on his side for about 4 seconds then stopped. What I got this time was a look in my direction and a bit of a lean into my hand. So I continued to rub his side with the back of my hand and stop, allowing him to walk away or ask for more. This went on for 10 minutes at which point I needed to move myself as my back was ailing me. I should also mention that in this time, I noticed his eyes soften, his ears seemed floppy, his breathing slowed, and he licked his lips multiple times and at one point laid his head on my leg. I was thrilled! I slowly got up and moved away, happily knowing he was wanting more of this friendship to continue. With so much uncertainty in our world, it is reassuring to give comfort and safety to an uncertain or defensive person or pet, even if for just a brief time. Knowing when to reach out and when to just be present is a fine line, one that is always changing but certainly always rewarding. I find myself saying this to many clients, “your dog is barking because he is frustrated.” Many young pups and adolescent dogs become spoiled and then frustrated when they are not able to get to something or someone all the time. You might think we could be discussing children, this emotion is very similar and difficult not to reward. This behavior is apparent in many dog training classes, when an owner is playing with her dog using a toy, another dog will bark at them as if to say “I want that toy or I want to play too”. Motivating your dog to focus on you is a good place to start while in your own home where there are no distractions. What about when a new dog enters the room? Many dogs will bark and pull towards the new dog as if to say “I want to say hello.” If during the first 5 months of your puppies life you always let him pull you to new dogs you encounter, then your dog will be incredibly frustrated when you decide it is not a good idea to let him drag you around. When a behavior has been rewarded repeatedly, then the reward is removed for the same behavior, frustration will certainly follow. Frustration enters the picture when punishment is applied or when he finds himself in a no win situation. Asking any alternative behavior and rewarding it is so much better than just saying “no” which only increases the frustration. Dogs can learn to cope with change and avoid frustration if they are rewarded for another behavior. Helping your dog learn to live in a human world without becoming frustrated is a process, one that should begin the day you bring him home!